Congrats to Desiree "I am following you! " Thank you for following us and Thank you everyone for your entries. We will be emailing you Desiree to get your mailing information. We hope you enjoy your mystery candle package brought to you by our sponsor Vicky our Independent PartyLite Consultant. 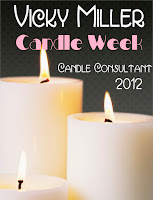 I would like to give a big thank you to Vicky for Sponsoring this week during Candle Week. If you live in the local area of Washington County Wisconsin and You love PartyLite make sure you give Vicky a message telling her you are interested in either throwing a party or becoming a Independent PartyLite Consultant and tell her we sent you. She is just a FABULOUS Person and well...... who doesn't love PartyLite! If you don't live near her and you just want to buy some of those great smelling candles you can always just hop on to her website and order them right from the site and have them delivered right to your front door. That's what I call a Scent-sational Idea! Bookmark her site and you will have easy access to their great new lines when they come out. I got a sneak peak at their new summer line. I think I circled half the book in my wish list to the hubby. we have another giveaway that starts today. Details on this giveaway will be posted this afternoon. This giveaway is in celebration of STAMP WEEK!!!. So pull out those rubber stamps and those ink pads and lets start stamping. Stamping is actually something new to me so I am very excited to do this project this week. It will force me to work a little bit out of my element. I know I look forward to seeing what PhotoJewels makes for us this week. Hope to see you all for the giveaway. One more thing...Once we get 100 "Facebook Fans" We are holding a small giveaway on our Facebook page to celebrate our appreciation to you our readers. Thank you again everyone for all your support!